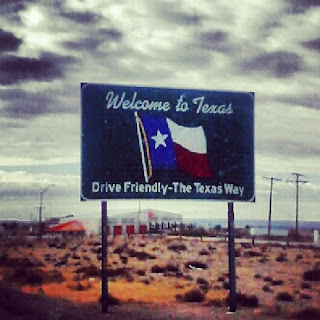 The last time I drove through Texas I was 14 years old and my dad (and therefore our family) had received orders to move from an Air Force base in Georgia to one in California. All I remember was it taking about 182 days (so it seemed) to get out of that state. Other than that there wasn’t much that left an impression…so at 42 years old I held the same expectations of long dreary days of driving through a whole lot of nothing. The only saving grace this time was that we actually had people we liked who lived in the state and therefore there was at least that to help break up the monotony of the vast prairie landscape. Well, I don’t know what happened but they sure did make Texas more interesting and beautiful in the almost 30 years it took for me to visit again! Yes, there were still vast stretches of prairies and winds sweeping the clouds into interesting shapes. And sure, there were miles and miles of barbed wire fences holding in (or out) I don’t know what for we didn’t see a whole lot of life in those pastures. But there were other things…ghost towns and old farm houses that told the tale of early pioneers…a breed of people way tougher than those you’ll meet at your local cross-fit gym or UFC fight. No lie. A little love from nature. 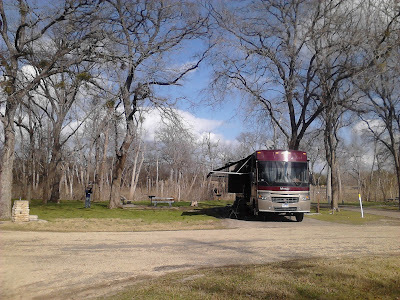 After leaving the Texacali Rose we headed south and spent 2 nights at Mother Neff State Park. It was here we made our first introductions to the Park Rangers after we somehow decided it was okay to drive the Mutiny up a small road that was clearly marked No RV’s. I suppose at the time it sounded more like a suggestion or even a challenge and we needed to see the reason behind the sign. Well, a few low branches gave way to increasingly tighter bends in the road so we decided to cut our losses, disconnect the Jeep and make a 43 point u-turn. And of course, this was about the time the Ranger pulled up and suggested that perhaps we didn’t see the large 4 foot by 6 foot sign at the bottom of the hill that said No RV’s. “Why no, we certainly did not see any such sign”. Settled in to our campsite at Mother Neff State Park. Eventually we got back down the hill and found the RV friendly road into the campground. We were quite happy to be one of only 2 rigs camping. Although quite charming I can’t imagine this as a destination spot but it is great for a couple of days layover when passing through. There are a few easy but short hiking trails and some bird watching areas but not a much more. 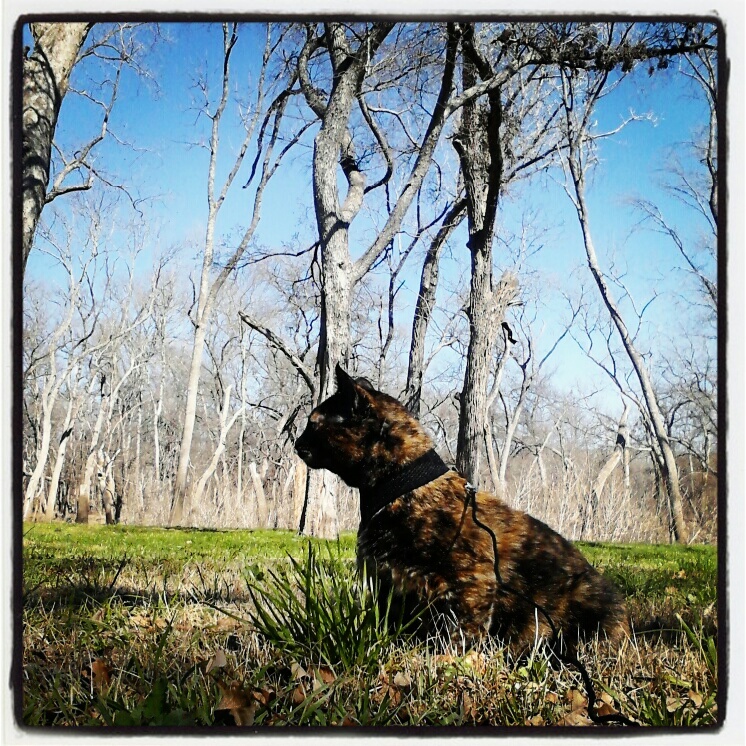 Miso enjoyed getting some fresh air and watching the birds. The next couple of days we spent in Round Rock (just north of Austin) with Clark’s half-sister, Shellie. 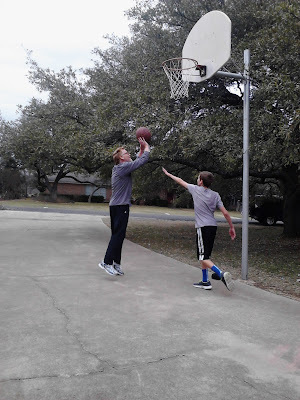 She put us up in her driveway and then, as per the Texas Hospitality Rule Book, made sure we had good food, great coffee and lots of fun. 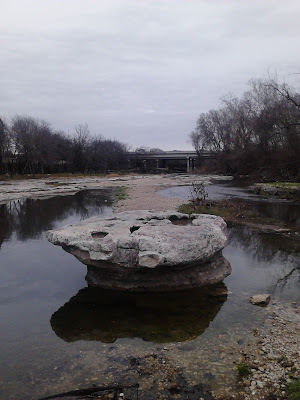 She introduced us to the World Famous Round Rock Donuts (which requires waiting in line no matter what day of the week it is), took us to see THE rock the town was named after, and then let us huddle in her car for warmth as we watched her son Caleb practice lacrosse. Uncle Clark and Nephew Caleb became fast buddies after a little one-on-one followed by some video game playing. THE rock for which the town is named after. Clark and Shellie entertained us one evening by holding an impromptu concert (and Shellie even sang some of her original songs!!). Although they weren’t raised together there was no lying about their being related as they strummed their guitars in a similar manner and formed a near perfect harmony with ease. It was a really moving evening. 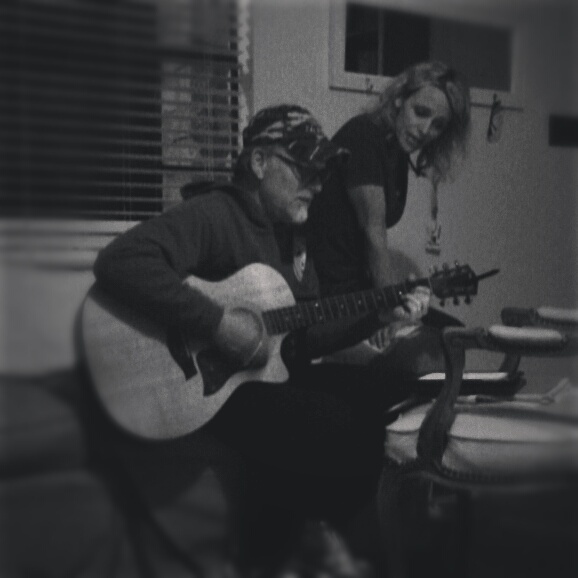 Watch out Donny and Marie! Texas was starting to grow on me. What was once a feeling of dread was slowly being replaced with a comfortable feeling. Perhaps I had judged Texas too harshly, holding on to childhood impressions although I was far from being that 14 year old. There is a certain kind of beauty and rawness in Texas and it was the first state we noticed a shift in the attitude of the locals. They were not only nice but they were a go-out-of-their-way nice. It made me feel better knowing this as we had another 2-3 weeks planned before we would be leaving the state.